We can make your patio look like flagstone, slate, brick, and a number of other designs and colors. Concrete floors need maintenance like any other floor. We can help preserve your concrete and keep your floors looking like new! Decorative concrete can transform walkways, patios, and driveways. 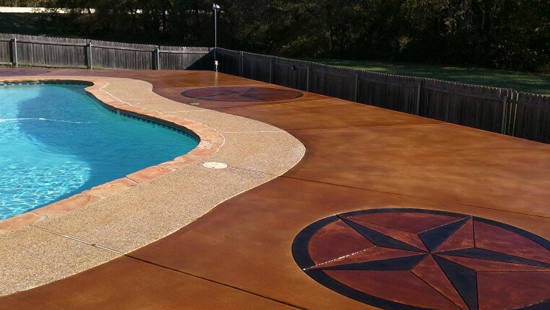 Boring gray concrete is a thing of the past and can now be molded into a stunning look and eye-catching design. Remodeling with stamped overlay will add value to your home or office while being very cost-effective. Decorative concrete has a beautiful presentation, low maintenance requirements, and is highly durable for both indoor and outdoor applications. We specialize in all aspects of Decorative Designs. If you would like to speak with us, please call or you can send us an email. We look forward to hearing from you! 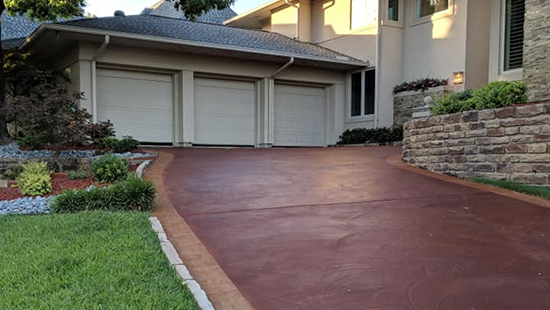 Flores Decorative Concrete is a small family business that provides decorative concrete services such as acid staining, decorative overlays, resurfacing, pool deck texture, scoring custom designs and epoxy coatings. We serve the DFW and surrounding areas. We strive to leave our customers with an amazing looking floor and satisfied with our work. What can Flores Decorative Concrete do for you?